The chart is constructed in the shape as shown the diagram below. The remaining 27 Nakshatra including Abhijit should be placed in numerical order (clockwise) as shown in the diagram. Janma Nakshatra in 1st, 2nd or 28th from Sun’s Nakshatra means the native will experience fear / anxiety / phobia. If in 3rd. 4th, 8th, 10th, 20th, 22nd, 26th or 27th the native will experience gains in all fields. The six Nakshatras from West to East i.e. 5th, 6th, 7th, 23rd, 24th & 25th will also produce the same results. Two Nakshatra, namely, 9th & 21st indicates curing of disease etc. If in 11th, 12th, 13th, 14th 15th 16th 17th 18th and 19th death may be predicted in rarest of rare cases. Caution is advised before coming to such conclusion. 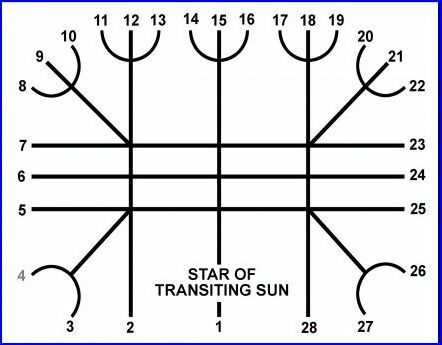 there is Surya Kalanala Chakra for natal chart too how to interpret and understand. SKC for natal chart you are referring to from jhora is for the time of birth and applicable for few days when Sun is in one Nakshatra. SKC should be erected during Sankranthi or even when Sun moves from one Nakshatra to an other. If you carefully read the purpose of this Chakra, you will realise it is more for a query at a particular time than for long time forecast. Thanks for the information. Do we also have to look to moon Nakshatra and it’s effects, other than Janm Nakshatra? No. Only Janma Nakshatra is to be used.